A prize winner and Herald-Chronicle staff search for winning tickets at the 2011 grand prize drawing. This year's grand prizes will be given away on Dec. 19. 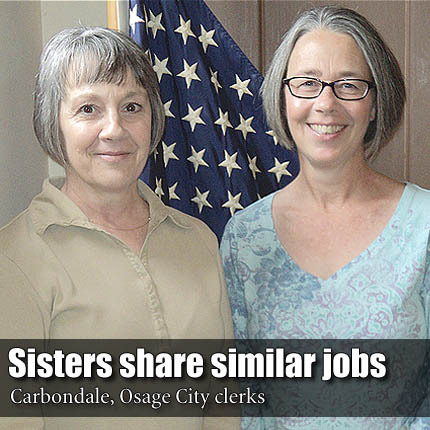 OSAGE CITY—The annual Christmas on Us contest is in its second of four weeks and $500 remains to be won. All four ticket numbers that were hidden in ads last week went unclaimed. Ticket numbers were hidden in the following ads: Harmon Dental, Santa Fe Trail Meats, Overbrook Family Dentistry and Dr. Lenahan and Associates. New ticket numbers are hidden in Christmas on Us sponsor ads found on pages 9-11 in this week’s newspaper. With all ten $50 instant prizes still up for grabs, the countdown is on for the grand prize drawing for two $1,000 prizes, and two $250 prizes, to be held 6:30 p.m. Wednesday, Dec. 19, at the Osage City High School auditorium. Everyone is invited and local entertainment will add to the holiday festivities. See pages 9-11 of this week’s Herald-Chronicle to find hidden ticket numbers in the ads and a complete list of rules. You must be present at the grand prize drawing to win, and the scrip money is only good at participating merchants. It is simple to win but tough to decide where to spend the winnings with the 30 merchants participating in this countywide contest.